A reminder to residents that the Emergency/Out-Patient Department is open daily (including weekends and statutory holidays) between the hours of 8:00 a.m. and 8:00 p.m. A Physician is on-call for emergency services. Please note that residents requiring access to Emergency Services after 8:00 p.m. are reminded to attend Fort Saskatchewan Health Centre, St. Joseph’s General Hospital (Vegreville) or another community hospital which offers 24-hour Out-Patient/Emergency Services. Notwithstanding the above, if you or an Ambulance should visit the Emergency Department after 8:00 p.m. because of a life-threatening emergency, a Nurse will assess your condition and will provide advice about treatment options, or request the presence of the Physician on-call for immediate treatment if required and deemed necessary. •	take care of people that are very sick or injured on a priority basis. This means the sickest people are seen first. If you go to an emergency department for care that isn’t urgent, you will not likely be seen right away. Ambulance and other emergency vehicle traffic can access the Emergency Department on the West side of the Main Entrance via 52nd Avenue and North on 54th Street. Emergency departments help people with their emergency health needs 24/7. Health problems are assessed, diagnosed, and treated. Treatments vary from minor to life-saving measures. The Emergency Department is also utilized as an Outpatient/ Ambulatory Care Department. This may include dressing changes, follow up to surgical procedures, minor excisions, intravenous therapy or treatments, etc. A reminder though is that this department operates on an emergent basis and emergency visits will take priority. The nurse will assess patients on that basis, continue to monitor and determine the priority of each case. The Acute Care Nursing Unit at Lamont Health Care Centre is comprised of 14 beds (6 private rooms and 4 semi-private rooms). The unit is staff by a Registered Nurse and Licensed Practical Nurse 24 hours a day. Health Care Aides are available for care needs as required as well. Upon admission, a detailed history is taken by one of the staff; this lends itself to the holistic care you will receive. This history is required in order to complete a care plan during the patient stay in hospital. A Physician is on call 24 hours per day for any concerns; the Registered Nurse on duty can call on this Physician at any time. A patient is assessed daily by his or her Physician or the Physician on call. Admissions can be medical or surgical in nature. 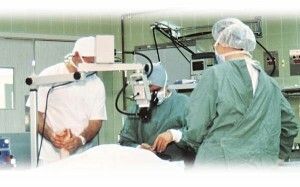 Please see the surgical section of the website for the services we offer. Admission to Lamont Health Care Centre is based on patient needs as assessed by the Physician and is limited to the services which can safely be provided. Should a patient’s need exceed the level of care which can be safely provided, arrangements will be made for transfer to an appropriate facility. (This could mean transport to a large tertiary hospital in Edmonton). Laboratory, X-ray, Physiotherapy, Pharmacy, Ophthalmology and Gynecology services are available including access to home care and palliative care services as required. A Social Worker is also available to provide assistance. Chaplain services are provided through the facility Chaplain. We do not recommend that valuables be kept at the bedside. Lamont Health Care Centre will not responsible for lost items. It is recommended a patient bring his/her own toiletries and sleeping attire; a hospital gown is available for use by patients. Phone and TV rentals are available. Visiting hours are from 10:00 AM until 8:30 PM. Under very special circumstances and with the exception of parents of children who are admitted, visiting hours may be extended. There is also a kitchenette for patient use. When any concerns arise the RN in charge is available to answer questions. The Nursing Care Coordinator, is also available 5 days per week to respond to your concerns and questions. Abuse of any kind directed at anyone is not acceptable under any circumstances when in Lamont Health Care Centre. All who enter must respect and value one another. Smoking is not allowed; those who wish to smoke are asked to smoke outside and away from entrances. The Lamont Health Care Centre has 2 operating rooms where more than 2,400 surgeries per year are performed. Pre and post-operative care for patients having surgery that may or may not require an overnight stay. Pre-Admission Clinic, preparation for patients requiring an inpatient stay following surgery. 8:00 am - 5:00 pm walk-in; registration at front office. Thereafter staff are on-site\on-call to process Emergency Department requests along with performing x-rays required for any Acute Care and Long Term Care patients\resident’s. By appointment only; registration at front office. Staff are on-site\on-call to process Emergency Department requests along with performing x-rays required for any Acute Care and Long Term Care patients\resident’s. General Radiography provides x-rays of the body. General Radiography uses x-rays to produce images of the structures inside the body, particularly bones. X-ray beams can pass through the body, but they are absorbed in different amounts depending on the density of the material they pass through. Service provides ECGs, which are studies of the heart. An electrocardiogram (ECG) is a test which measures the electrical activity of your heart to show whether or not it is working normally. An ECG records the heart's rhythm and activity on a moving strip of paper or a line on a screen. Cardiac stress test is a test used to measure the heart’s response to exercise on a treadmill in a physician controlled and supervised clinical environment. Standard cardiac stress testing compares the continuous ECG, the blood pressure measurements and patient’s physical response to the exercise to determine if the patient has CAD (coronary artery disease). The results can be interpreted as a reflection of one’s general physical condition, used to diagnose heart blood flow disease, and for patient prognosis after a heart attack. Appointments for Dr. Azim Bharmal are by referral only; made through his office. Lamont Health Care Centre has 105 beds in Long Term Care with four of the beds designated as community beds (i.e. two respite and two palliative). Nursing services, rehabilitation therapy, recreation therapy, dietary consulting, social work services and general support services are essential components of the care we provide. Diagnostic services i.e. Laboratory and X-ray are accessed from the Acute Care unit. The heart of our organization is the Resident and the people who work here. We have a caring, compassionate staff that are dedicated and educated to meet the needs of the Residents. Our service is built on the premise of trust and respect for the rights and dignity of each person. Our model of care is Resident-Focused and promotes choice and independence with in an environment which ensures that medical needs are provided as required. The Pharmacy Department at the Lamont Health Care Centre plays a key role in providing patients\residents with quality health care services. They work to ensure patients\residents drug treatment plans are safe, effective and support their medical care plan. The pharmacist works within an interprofessional team including doctors, nurses, dieticians, social workers, physiotherapists, occupational therapists and other health care professionals. The Pharmacy Department is responsible for overseeing the preparation and distribution of prescription medication and other controlled substances and equipment. They review patient\resident prescriptions and drug information to look for warnings and potential interactions with other medications or treatments. The Pharmacist will also provide medication information and counselling to patients\residents and their families, caregivers and other health care professionals as needed and on discharge. Onsite rehabilitation services are available for inpatient needs including for assessment and treatment of acute care patients, long term care residents and for emergency patients on a consultation basis. Services include: physiotherapy and occupational therapy. •	Physiotherapy is available Monday to Friday. The primary goal of physiotherapy is to assess each patient/resident as required/requested, in order to establish patient/resident centered goals and individualized treatment programs focused on restoring or maintaining physical function and mobility. •	Physiotherapy works closely with the multidisciplinary care team (patient/resident, family, physician, occupational therapy, nursing, pharmacy, social work, dietary, recreation, etc.) in order to meet established goals. •	Occupational therapy is available on a part-time basis. The primary goal of occupational therapy is to provide assessment and/or consultation and treatment (as able) to patients/residents related to cognition, swallowing, wheelchair seating and prescription, and assistive device/equipment needs, in order to achieve or maintain patient/resident independence in their activities of daily living. •	Occupational therapy works closely with physiotherapy and the rest of the multidisciplinary care team in order to meet established goals. The role of the Recreation Department is to assist Patients\Residents in achieving and maintaining leisure lifestyles that will enhance their health and well-being. The primary function of the Department is to provide purposeful interventions and leisure activities that will stimulate and help meet the mental, social, emotional, and physical needs of the Patients\Residents. The facility has a very active Recreation Department; Recreation Services are available Monday to Friday from 7:30 a.m. to 7:45 p.m., and on Saturday from 8:00 a.m. and 4:00 p.m.
Programs range from physical activities such as hockey, exercises classes and games to more cognitive based activities like Trivia, News and Memory Joggers. Special events occur regularly to help celebrate the holidays and may include dinners, visits from community groups, entertainment and/or dances. The department also has a handibus and uses it to take residents on bus outings for shopping, picnics, museums, the A.C.T. Centre at Rundle Park and various other short trips. The Resident Council holds meetings on the last Thursday of every second month at 1:15 p.m. These meetings are open to all Long Term Care Residents and their family members. Provides assessment and support to help people deal with an illness or injury. Assesses clients' needs and gives support to help them deal with illness or injury. The Registered Dietitian is an integral member of a multi-disciplinary health care team including doctors, nurses, pharmacists, social workers, physiotherapists, occupational therapists and other health care professionals. All Residents are provided with three well-balanced meals and two snacks per day. Special diets are provided on the order of the Physician in charge. These meals are planned, prepared, and served under the supervision of a qualified Dietary Supervisor or Dietitian. If Nursing Staff feel the Resident is at risk for choking, an assessment process will be put in place with the Occupational Therapist and/or Consulting Dietitian. The Patient Food Service Department prepares and distributes approximately 131,000 meals each year for the 14 Acute and 105 Long Term Care Patients\Residents/as well as A-la carte for Assisted Living in MYM/ and our extremely busy small cafeteria for staff and visitors. Breakfast	8:30 a.m. - 9:00 a.m. Families wishing to bring in cakes, etc. for special occasions such as birthdays are requested to make arrangements with the Charge Nurse or Dietary Supervisor to be certain your family member does not have any special dietary needs. Pamphlet “Bringing Food to Family” is available from our Dietary Department. Our 3 week winter or summer menus are posted on boards in all areas. Daily menu and if there are any Menu Adjustments, they are posted on white boards daily. Cafeteria services are available to families between 6:30 a.m. – 6:00 p.m. daily. Charges will apply to the request for Cafeteria services. In our cafeteria our LTC residents do not pay for the meal of the day or coffee but anything from our showcase is an added cost. We just ask that you notify dietary department that you will be bringing them to cafeteria for meal so that their meal stays in the kitchen. The Cafeteria accepts "Cash Only". Prior arrangements should be made with Dietary Department for special functions. Payment must be made to the Dietary Department no later than the day before the function. It may be necessary for you to pick-up/bring back coffee carts to and from the dietary department depending on our staffing levels. 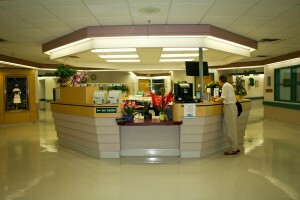 The Business Office is the initial contact with the Public from manning the Switchboard to registering Patients for ER/OPD, Diagnostic Services, Specialist Clinic appointments, Day Case procedures, Pre-Admission Clinics to admitting Patients to Acute Care, Long Term Care and Morley Young Manor. Approximately 22,000 visits are registered per year. The Business Office Staff receipts Account payments and Donations, is responsible for accessing Telehealth sessions, hooking up TV’s and telephones and processing incoming & outgoing mail and attends to clerical services, i.e. typing correspondence, minutes, etc. 8:00 a.m. to 8:30 p.m. Saturday, Sunday and Statutory Holidays. The Lamont Health Care Centre has on on-site Laundry Department which processes approximately 161,000 kilograms, (350,000 pounds) of laundry each year. We purchase high quality linen and re-useable apparel which results in long term cost savings for our organization. The Lamont Health Care Centre has policies in place to ensure that the housekeeping staff are trained to adhere to and or exceed the best practices with regards to Infection Prevention and Control standards. This is done in conjunction with the Alberta Health Services Infection Prevention and Control Committee’s recommendations. Housekeeping staff are on site daily to look after approximately 40,000 sq. ft of Acute Care and approximately 45,000 sq. ft. of Long Term Care sections of the Lamont Health Care Centre. •	Floors are washed, garbage’s emptied, and routine dusting is done. •	Wash patient\resident lights and furniture. •	Terminal Clean all rooms at least annually (this is a complete cleaning of rooms including washing of walls, stripping & waxing flooring, curtains, windows etc.). In the event of an outbreak of either respiratory or gastrointestinal illness the housekeeping staff is trained in and aware of the necessity to partake in additional measures for cleaning. •	to source, order, receive and distribute all of the products and supplies used throughout the organization. •	to replenish and stock all Nursing Supply Carts in the Emergency, Acute Care and Long Term Care departments. •	to submit for payment all invoices related to the above purchases. •	to ensure all medical & surgical products on hand have not exceeded their expiry date. •	to maintain and provided updated material safety data sheets (MSDS) to all applicable departments as part of the WHMIS (Workplace Hazardous Materials Information System). •	to source, order, receive and distribute all of the all of the capital equipment purchased for the organization throughout the year. •	Types of and volume of surgical interventions performed during the year. •	The severity of the health issues that the patient\residents are admitted with during their stay. •	Enhancement to existing health services. •	The addition of new health services. •	The availability of capital equipment grants and\or donations received for capital equipment purchases. •	Medical Surgical Supplies - $800,000 - $900,000. Maintenance staff is on site daily and facility maintenance is ongoing process. The Lamont Health Care Centre’s maintenance staff look after a building of approximately 93,000 sq. ft. and it’s surrounding gardens, lawns and sidewalks. The building complex contains 12 roof air make-up units and 4 boilers. The maintenance staff process 1,000 to 1,200 maintenance requisitions each year. The Lamont Health Care Centre has policies in place to ensure that the routine inspections and a preventive maintenance programs for the Plant and Building are completed on a recurring basis. 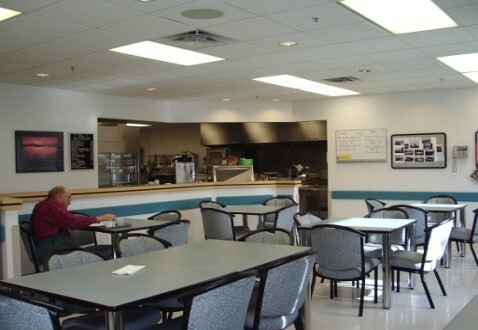 These recurring inspections help ensure that the Lamont Health Care Centre adhere to and or exceed the best practices with regards to Infection Prevention and Control Standards, Accommodation Standards, Building Code Standards, Fire Code Standards and any other applicable Legislative Regulations for the operation of a Health Care Centre. Pastoral/Spiritual Care Services can be accessed through our facility’s Spiritual Care Director, Rev. Debbie Brill. The pastoral/spiritual care provided ranges from non-denominational to a variety of faith traditions. Support is provided to Acute Care patients, Long Term Care residents and families through on-going visits, prayer, spiritual counselling and one-to-one visits. 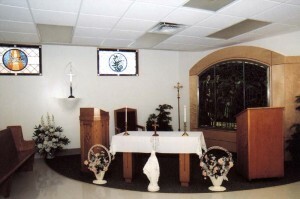 Weekly services are also held in the facility’s chapel. Residents/patients, along with family members, are invited to attend. In addition, Roman Catholic Church Services are held every Saturday in the chapel, commencing at 4:00 pm. • That God plays an active role in the healing process, and that recognition understanding and acceptance of God’s part in it can be of benefit to the patient/resident/staff. • That this spiritual healing be extended to family, friends and staff, in a manner which will promote wellness and wholeness. If you wish a clergy visit, please ask the nursing staff to call the clergy of your choice. Clinic is located in the Hallway past the Acute Nursing Station at the Lamont Health Care Centre. Located on the ground floor of the Archer Building at Lamont Health Care Centre. Clinic Days & Hours: Monday, Tuesday, & Wednesday: 9:00 a.m. – 5:00 p.m.
Office Hours: 7:00 a.m. – 2:00 p.m. Visits are made at least monthly. Please phone the Lamont Health Care Centre Business Office at 780-895-2211 if you wish to access this Service. Bouma Orthotic Clinics and Troppman Prosthetics Ltd. have partnered with Lamont Health Care Centre to hold clinics for those persons requiring these services. Optometrists are available for scheduled appointments all day every Tuesday and Thursday and on Friday mornings. The Optometry Clinic is located on the Ground Floor of the Archer Building. The AHPCN is located on the Ground Floor of the Archer Building. Referrals are accepted from Lamont Physicians or one can phone directly for an appointment. •	Nutrition Support and Education. These Services are available from the Lamont Health Unit which is located in the Archer Building of the Lamont Health Care Centre. 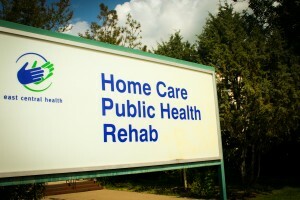 Residents requiring access to these Services may call directly to 780-895-5817 or call 780-895-2211 and ask for Home Care, Community Rehab or Mental Health & Addiction Services. Clinic Hours:	9:00 a.m. – 5:00 p.m.
Clinic is located on Main Street Lamont (next to Alberta Treasury Branch). Appointments for Dr. Azer, are made through his respective office. Appointments for Dr. Harris, Dr. Kutzner and Dr. Heston are made through their respective offices. Appointments for Dr. Bharmal are made through his office. Appointments for Dr. Manolescu are made through his office. Volunteers play an important role in our hospital, volunteering their talents to assist Residents and Patients with various activities. 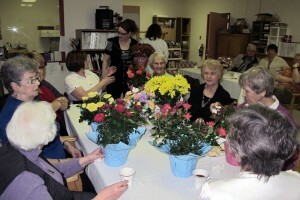 Anyone who has an interest in serving at our Community Hospital is invited to contact Ms. Wendy Horricks at 780-895-2211; she will be pleased to offer a tour of the facility and also discuss areas of interest where you can play a significant role in the care and service offered to our Residents and Patients. We know that Volunteers are the heart of our Community and they do not replace Professional Staff; however, the presence of Volunteers in our facility is a very valuable asset as they interact and build relationships with Patients/Residents. These relationships offer a unique experience in fostering Patient/Resident satisfaction and bringing smiles to the lonely and disenchanted. You can make a difference; we invite you to take the first step and consider joining the team. Please note that the Auxiliary of the Lamont Health Care Centre is recruiting new members and extends an invitation to the public to join the organization. The reward is the giving of one’s self in service to others. Men, women and youth are welcome to join. For further information please contact Ms. Sheila Vilcsak at 780-895-2971.